As the Masters – golf’s most prestigious tournament and the season’s first major championship – gets underway on Thursday, a strong contingent of Aussies will seek to once again crowd the top of the Augusta National leaderboard. Seven players from Down Under will tee up, including two first-timers and an amateur. A year ago, Adam Scott became the first Australian to claim the green jacket, something even the legendary Greg Norman was not able to do. Jason Day finished third, Marc Leishman tied for fourth and John Senden tied for 35th to complete a spectacular showing for the Aussies. Day, who won the Match Play Championship in February, fancies his chances at Augusta, and for good reason. He led last year’s tournament with just three holes to go and finished tied for second in 2011. In just his fifth season as a professional, Day has six top-10 finishes in 13 starts, including three top 10s in last year’s four majors. After missing the last seven weeks because of a thumb injury, Day declared himself healthy for another run at the green jacket. He rose to No. 4 in the Official World Golf Ranking after his dramatic Match Play win, but for now he still plays second fiddle to Scott. The defending Masters champion narrowly missed a chance to supplant Tiger Woods as World No. 1 after a messy finish cost him a win at the Arnold Palmer Invitational in late March. 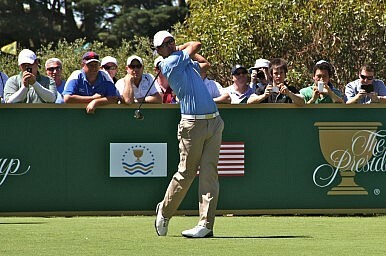 Scott had opened with a record-tying 62 and led by seven strokes after two rounds, but was unable to hold on. Scott will have to erase the memory of that collapse if he is to become the first Masters champion to repeat since Woods achieved that feat in 2002. Scott also had to represent his country – and its culinary traditions – at the annual champions dinner on Tuesday. As is the custom, the defending champion gets to pick the menu, and Scott decided to play it safe. While his choice of “Moreton Bay Bugs” flown in from Australia initially caused a sensation, it turns out they are just lobsters. More important, no kangaroo meat was served. While Scott is the lone Aussie at the champions dinner, a trio of his countrymen will be surveying the Augusta National grounds for the first time. Two Australians, in fact, played their way into the Masters over the past two weeks. Steven Bowditch shot a final round 76 but that was good enough for his first PGA Tour victory at the Valero Texas Open. A week later, Matt Jones scored a dramatic playoff win at the Shell Houston Open to become the last person to punch his ticket to this year’s Masters. In fact, had Scott not blown his huge lead at Bay Hill, Australia would’ve produced the winners in the last four PGA Tour tournaments preceding the Masters. Senden, who will be making his fifth appearance in Augusta, won the Valspar Championship the week prior to the Arnold Palmer Invitational. Australia is further buoyed by the presence of amateur Olive Goss, who plays collegiately at the University of Tennessee. Goss qualified by finishing as the runner-up at last year’s U.S. Amateur, and he would like nothing better than to make the cut so he can celebrate his 20th birthday on the famed course Saturday. Goss had lunch and played a practice round with Day last week, receiving lots of tips and advice. But on Monday he was holed up in the Crow’s Nest, where the club hosts its amateur guests, as the course was closed because of rain. The Aussies as a group have done a lot of studying at the Masters, and are ready to prove Scott’s win last season isn’t a fleeting occurrence. As the ringleader, Scott hopes his win ushers in a new golden age for golf Down Under.